Once again, I am counting my blessings and packing my bags as I prepare Friday to embark on the journey of a lifetime: my very first speaking mission to Australia! I'm traveling at the invitation of some very generous faith communities in Australia. As I anticipate all of the things that I'll learn along the way, I want to thank in a special way Marist College Canberra and Nathan Ahearne who have made this trip possible. In anticipating their celebration of their 50th Jubilee this year, Nathan, who serves as Director of Faith Formation for the college. What began as a trip to Marist College Canberra has extended into opportunities to serve in the Archdiocese of Sydney and the Diocese of Broken Bay as well. While in Australia, I will speak to groups of elementary and high school students, parents, school administrators, teachers, diocesan communicators, and will offer my first international "Grace of Yes" retreat. To say that I'm excited is a massive understatement. But I ask for your prayers as I embark. As we in our own country face challenges with Church hierarchy and leadership, Australia's faithful have known these trials as well. My hope is to bring light, peace, joy and a simple message of faith to every person I meet along my path. I know all about the speaking venues I'll be visiting, but to be honest I haven't planned anything in the way of "tourist" types of opportunities. I've learned from past trips like this that my greatest joy will come from the new friendships that I'll make along the way. I ask for your prayers, that I will serve well and give those who are bringing me my very best. 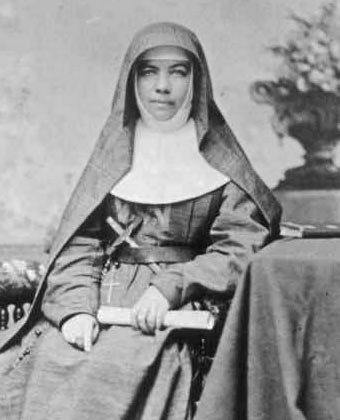 Saint Mary MacKillop - (1842-1909) Australia's patron saint and first canonized saint. Known for her love and care for those in need, St. Mary devoted her life to education and service. During his homily at the canonization of Saint Mary of the Cross, Pope Benedict XVI said, "For many years countless young people throughout Australia have been blessed with teachers who were inspired by the courageous and saintly example of zeal, perseverance and prayer of Mother Mary MacKillop. She dedicated herself as a young woman to the education of the poor in the difficult and demanding terrain of rural Australia, inspiring other women to join her in the first women's community of religious sisters of that country. She attended to the needs of each young person entrusted to her, without regard for station or wealth, providing both intellectual and spiritual formation. Despite many challenges, her prayers to St Joseph and her unflagging devotion to the Sacred Heart of Jesus, to whom she dedicated her new congregation, gave this holy woman the graces needed to remain faithful to God and to the Church. Through her intercession, may her followers today continue to serve God and the Church with faith and humility!" Saint Marcellin Champagnat - (1789-1840) Founder of the Little Brothers of Mary ("Marists"), Saint Marcellin was canonized by Saint Pope John Paul II, who said of him, "Saint Marcelino announced the Gospel with an ardent heart. He was sensitive to the spiritual and educational needs of his time, especially the prevailing religious ignorance, and the abandonment which youth were experiencing….he was a model for all parents and educators to help them look upon youth with hope, to encourage them with total love, which will make a true human, moral and spiritual formation possible." When I learned that I would be staying in Sydney for the first part of my journey, I went looking for accommodations and was delighted to discover that I could actually stay at Mary MacKillop Place, where Saint Mary lived, died and is buried. Her feast is celebrated this week, on August 8, and my lodgings at the onset of this adventure so close to her resting place bring such joy to my heart! I'll be bringing you along for this adventure mostly via social media. While I do hope to fit some blogging in along the way, my speaking engagements are my top priority. So please be sure to follow me on Facebook, Instagram, and Twitter. If you've been to Australia, especially to Sydney and Canberra, and have recommendations of sites to visit, I'd love to hear from you! We take off on Friday evening, so pack your virtual bags!